This weekend, I am back in Los Angeles, California to serve as a game moderator for the 28th Honda Campus All Star Challenge (HCASC) quiz bowl tournament that has been sponsored by American Honda Motors since its inception in 1989. This program is a particular treat for me as I was one of the nation’s leading scorers in the early 90s while playing for Morehouse College from 1991-94, and for Florida A&M University in 1995. In an era in which people like the late Supreme Court Justice Antonin Scalia question the academic prowess of HBCUs, one in which even some Black folks make ignorant comments like “I would never send my kid to one of THOSE colleges,” it is a pleasure for me to watch the next generation of Black leaders compete in an academic setting. In 1991, I was a freshman at Morehouse College when the Florida A&M University team, coached by my mother, Dr Vivian Hobbs, defeated West Virginia State University to win the National Championship and 51k in prize money from Honda. While it was awesome to watch my mom’s team dominate the competition on BET that summer, it was somewhat bittersweet for me when they soundly defeated a really good Morehouse team that featured some of my closest friends and classmates in the semi-finals. In a way, I felt as if I had let Morehouse down that year because in the purple haze of my freshman year Bacchanalian pursuits, I did not try out despite my mother admonishing me to do so. You see, I had distinguished myself in quiz bowl and Mindquest in middle and high school in Tallahassee, Florida, with my mom serving as my very first coach while she was still teaching middle and high school English at FAMU High School (K-12). As such, while I was proud of her team’s victory in ’91, as I watched the Rattler scholars get publicity in every major newspaper and magazine in Florida, a celebratory dinner with then Florida Governor Lawton Chiles, and treated like rock stars by then FAMU President Frederick Humphries as he brought the team with him on recruitment fairs across the country, I was excited about having an opportunity to play once again—if I made the team. When I made the Morehouse team as an alternate the following year, some of my teammates were still salty about the outcome from the previous year. One or two were even apprehensive about a rematch being that the FAMU team returned all five players. Now, an alternate is like a reserve player on any sports team. I was the alternate because there were four other talented brothers who had outscored me in the campus tournament that previous October. The speed of the game was much quicker than it had been in high school and having been almost two years removed from play, I needed to shake off the rust. That following March, when we arrived in Tallahassee for the sectional tourney, I knew that I would be mostly in a supportive role unless our coach, Morehouse Honors Program Director and English professor Dr. Jocelyn Jackson, saw fit to play me. She did not, however, as she chose to stick with the starters who had made it to the semi-finals the year before. This was tough on me, though, as my high school coaches Norish Adams and Ron Strazzulla had stopped by to see me play, as did other friends and mentors who were shocked to see Ol’ Hobbs riding the bench. Being a former athlete and drum major in the band, I knew to stay upbeat and watchful for my chance to play while supporting my teammates. Our team was 6-0 by late afternoon—the same as FAMU—and everyone on campus was eager to watch the 7 pm match-up between Morehouse and the defending champion Rattlers. By ’92, my mother and Dr.Jackson had become close friends and mom, subjective when it comes to me but highly objective when it comes to evaluating quiz bowl talent (as her having won eight national championships since confirms), boldly mentioned to her friend during a cigarette break that if Morehouse wanted a “chance” to beat her team, that she needed to consider playing me. When Dr. Jackson said that she did not want to break up her team’s chemistry, mom replied that she understood all of that, but that her son was fearless and had not been subjected to the critical beatdown by her team the year before. Yeah, Momma Hobbs is uppity with a wicked sense of humor, too LOL. Right before the match, Dr. Jackson informed me that I would be lining up. My heart started beating rapidly with excitement and I began to get a tad nervous when I saw FAMU President Humphries walk in and take his seat next to mom for the standing room only match. But even more crucial for me was that a short while later, I noticed my dad, the late Charles Sr, walk in and stand near the back of the room. He gave me a nod and I nodded back, ready to put on a show for the hometown crowd. I knew that I would play well; truth be told, I dominated and led all scorers in a crucial back and forth match that was won when I correctly answered the last question. 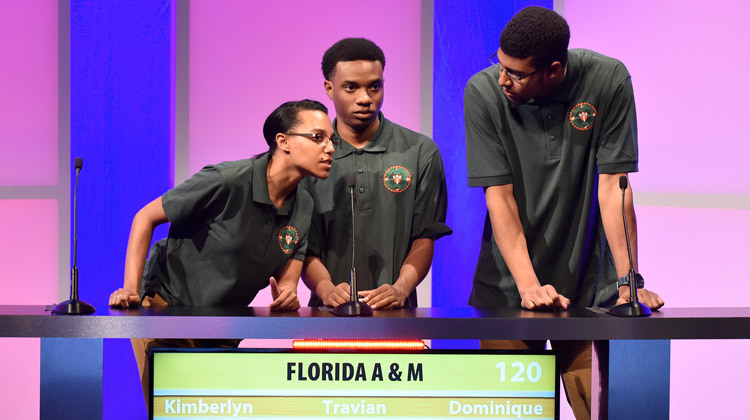 FAMU suffered its first loss in program history that day, and over the next three years, I and my Morehouse teammates won 41 games with only four losses—twice to Tuskegee University in national championship games featured on BET. As you can tell, I still hold game play memories dear to my heart. But far more importantly, many of the men and women that were once rivals remain dear friends who are renowned educators, doctors, lawyers, physicists and chemists, preachers, movie producers and college administrators, to name just a few endeavors where black academic excellence has led to black professional achievements. To that end, the next few days will bring me joy as I renew old acquaintances, and watch the next generation of quiz bowl scholars enjoy the game that meant and still means so much to so many of us who played years ago.